The word project in the group’s name is due to the experience of traveling with these programs and performing with musicians of each country. This group has become a form of cultural exchange, where musicians of different places contribute to the interpretation of the Jose Luis` music. The group that is based in Spain is integrated by: Vicente Sabater, German Muñoz, Mario Franco y Pepe Moreno. The José Luis Martínez`s Music Projectt is based on original music for guitar and ensemble. ​A dynamic concert with music composed by me, where an ensemble of first guitar, second guitar, clarinet, flute, bass and drums or percussion give life to the pieces inspired in different rhythms. The concert is ideal for all the people who enjoy music and the Spanish guitar, the show is intended for audiences of all ages. The wonderful thing about music is the many possibilities when you create something new. It’s exciting to contribute to the classical guitar world by creating new compositions, and surrounding it with a modern chamber music ensemble. The guitar is the clear protagonist, although every instrument was created to enhance the musical experience. My career has permitted me to travel to many countries and learn from their music culture. The motivation for creating these compositions is to combine my Spanish culture with what I’ve learned in 40 years of career. The Music Project has been presented previously in Mexico, Costa Rica, Yemen, Cuba, Montenegro, Czech Republic among other places, with local musicians. In Turkey (Izmir) and Spain it was performed with orchestra, and in Madrid it was recorded and emitted by TVE in Conciertos de la 2. Recorded and televised by TVE. ​ The José Luis Martínez`s Jazz Project, with improvisations of new jazz motifs composed for the group. The experience of this concert is unique do to the new melodies created by brilliant composers for this ensemble. The group is composed by first guitar, second guitar, clarinet or Saxophone, bass and drums that improvise to give life to these motifs. The concert is ideal for all the people who enjoy jazz music and the guitar, the show is intended for audiences of all ages. After a long career in classical music, I decided to intensely study jazz. I think every musician should practice jazz to experience the plenitude of music and expand their musical language. The creation process in jazz is continuous and experienced live through the improvisations, which become the protagonists of the concert. The original motifs for the improvisations were composed by Chema Saiz, Luis Barroso, Jorge Magaz and I. The Jazz Project is a new variant of the Music Project that has been presented previously in Mexico, Costa Rica, Yemen, Cuba, Montenegro, Czech Republic among other places, with local musicians. In Turkey (Izmir) and Spain it was performed with orchestra, and in Madrid it was recorded and emitted by TVE in Conciertos de la 2. José Luis Martínez Moreno: In forty years of career as a professional guitar player and composer I´ve had the opportunity of visiting over forty different countries. This experience allowed me to establish friendships with musicians and composers and learn about different rhythms and music from around the world. My compositions are a tribute to those memories, with a musical fusion of my Spanish origins and the different tinctures and flavors of the world. Vicente Sabater: Clarinetist based in San Lorenzo de El Escorial, Madrid, where he is also professor at the Municipal School of Music. He also collaborates with the big bands and conservatories in the surrounding areas. German Muñoz: Doublebass of the TVE (Spanish Television) Orchestra for more than 20 years, he studied in Hoschschule für Musik and Darstellende Kunst in Vienna with Professor Ludwing Streicher. Mario Franco: Second guitar with my ensembles for more than 10 years. Pepe Moreno: Drums with my ensembles for more than 5 years. 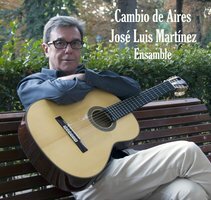 Original music by José Luis Martínez for Classical guitar & Ensemble. After forty years as a music professional, José Luis has had the opportunity to visit over forty different countries, with their rhythms and music, aspects that influenced his personal life and professional career. ​His works are a tribute to those memories with a musical fusion of his Spanish origins and the different tinctures and flavors of the world. The Trio Vicente Espinel was formed with the intention of reviving the tradition of ´pulse and prong´, and was integrated by Carlos Usillos (bandurria), José Luis de Andrés (lute) and José Luis Martínez (guitar). The album seeks to cover eight centuries of musical aesthetics - from medieval music to the twentieth century - through transcriptions and original works by José Luis Martínez Moreno. Bata de Cola a bold and knowledgeable blend of classical and flamenco guitars interpreted by José Luis Martínez (classic) and Rafael Andujar (flamenco). The Martínez-Andujar Guitar Duo have been together for more than 20 years and it becomes evident when listening to the two guitars harmoniously blending together. I specialized in époque or early music, with Javier Hinojosa and José Miguel Moreno, while practicing the vihuela and Renaissance lute (1979) and was awarded 1st prize in the International Guitar Contest of Béarn d’Arthez in France (1983). I graduated with honors from Father Soler Conservatory of San Lorenzo de El Escorial, with José María Gallardo as teacher. (1994) Worked as a guitar professor in the Boadilla del Monte Conservatory for 11 years. (1988-1999) Since then I´ve traveled and performed in Asia, Europe, Africa and the Americas. The classic guitar is the clear protagonist of my career and compositions, proved by more than forty works for guitar. Although my compositions are not all circumscribed to this instrument, I have created chamber music for duos, trios and ensembles, for orchestra, ballets and a concert for guitar and orchestra.